STEM U is over for the 2014-2015 year. We hope that you have enjoyed your experiences this year, and that you will continue to be a part of STEM U next year. If you wish to obtain a hard copy of the STEM U Survival Guide, please contact Dr. Villanueva. 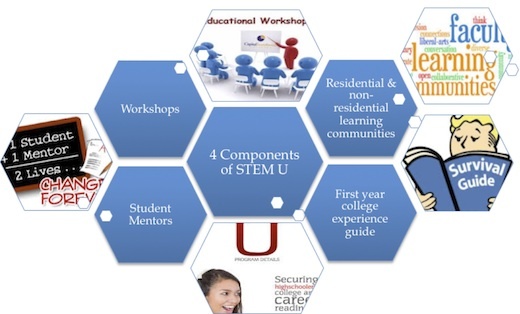 For a pdf of the STEM U Survival Guide, click here. 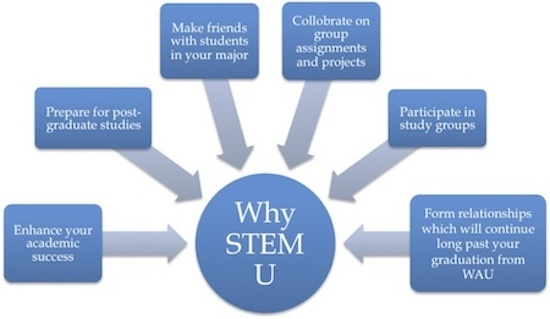 STEM University (STEM U) is a learning community designed for students majoring in the following STEM fields: Biology, Biochemistry, Chemistry, Computer Science, and Mathematics. What can STEM U do for you? Enhance your academic success. Studies have shown that students who participate in programs like STEM U earn better grades (1,2). Increase your chances of being accepted into the graduate program or career of your choice. The higher your GPA is in your science classes, the more attractive you will be to recruiters seeking to fill limited numbers of positions for jobs or in graduate or professional programs. Help you to make friends with students in your major. Make it easy to collaborate, when appropriate, with your classmates on projects and group assignments. Make it easy to participate in study groups, which in turn will increase your chances of doing well in your classes. Help you form, with your classmates and professors, relationships which will continue long past your graduation from Washington Adventist University (WAU). Student mentors: Dedicated student mentors will be available for the freshmen science courses and in the residence halls (Halcyon Hall and Morrison Hall). These student mentors will be successful science majors that you can talk with about your science classes or about other questions related to being a science major. Workshops: Various workshops will be offered throughout the 2014-2015 academic year. These workshops will cover topics such as goal setting, career planning, test-taking strategies, and other issues related to your success as a student interested in the STEM fields. As part of the STEM U program, you will also have the opportunity to live on the STEM wing in the residence hall. Here, you’ll be living next door to other students in biology, chemistry, biochemistry, math, and computer science. Since these students are all participating in the same program, you will easily be able to meet with fellow science students for study sessions or just to share survival tips. If you’re not planning to live in Halcyon Hall or Morrison Hall, you will have the opportunity to join the STEM commuter students’ group, which also meets for study sessions and other science activities. Survival booklet: A survival booklet will provide a listing of campus resources that will be helpful to you as a science major. For more information on this program, please check us out on Facebook (https://www.facebook.com/STEMUATWAU), or contact Dr. Villanueva (mvillanu@wau.edu; 301-891-4462) or Mr. Randolph Robin (rrobin@wau.edu). Welcome to WAU and STEM U, where science is champion! 1. Tampke DR, Durodoye R. 2013. Improving Academic Success for Undecided Students: A First-Year Seminar/Learning Community Approach. Learning Communities Research and Practice, 1(2), Article 3. Available at: http://washingtoncenter.evergreen.edu/lcrpjournal/vol1/iss2/3; accessed 6/13/14. 2. Price DV. 2005. Learning Communities and Student Success in Postsecondary Education. A Background Paper. New York, NY: MDRC. Available at http://www.mdrc.org/sites/default/files/full_421.pdf; accessed 6/13/14.